Learn how to keep your data models up-to-date with this Core Data migrations tutorial! 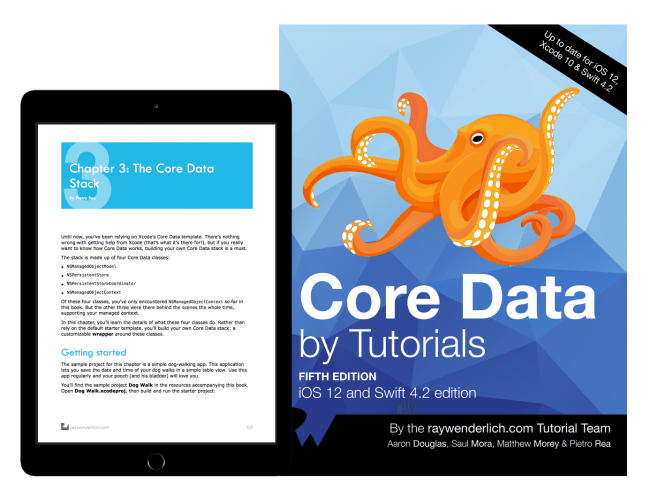 This is an abridged chapter from our book Core Data by Tutorials, which has been completely updated for Swift 4.2 and iOS 12. This tutorial is presented as part of our iOS 12 Launch Party — enjoy! During app development, well before the ship date, thorough testing can help iron out the data model. However, changes in app usage, design or features after an app’s release will inevitably lead to changes in the data model. What do you do then? You can’t predict the future, but with Core Data, you can migrate toward the future with every new release of your app. The migration process will update data created with a previous version of the data model to match the current data model. This tutorial discusses the many aspects of Core Data migrations by walking you through the evolution of a note-taking app’s data model. You’ll start with a simple app with only a single entity in its data model. Let the great migration begin! However, there are some cases in which you can avoid a migration. If an app is using Core Data merely as an offline cache, when you update the app, you can simply delete and rebuild the data store. This is only possible if the source of truth for your user’s data isn’t in the data store. In all other cases, you’ll need to safeguard your user’s data. That said, any time it’s impossible to implement a design change or feature request without changing the data model, you’ll need to create a new version of the data model and provide a migration path. When you initialize a Core Data stack, one of the steps involved is adding a store to the persistent store coordinator. When you encounter this step, Core Data does a few things prior to adding the store to the coordinator. First, Core Data analyzes the store’s model version. Next, it compares this version to the coordinator’s configured data model. If the store’s model version and the coordinator’s model version don’t match, Core Data will perform a migration, when enabled. Note: If migrations aren’t enabled, and the store is incompatible with the model, Core Data will simply not attach the store to the coordinator and specify an error with an appropriate reason code. To start the migration process, Core Data needs the original data model and the destination model. 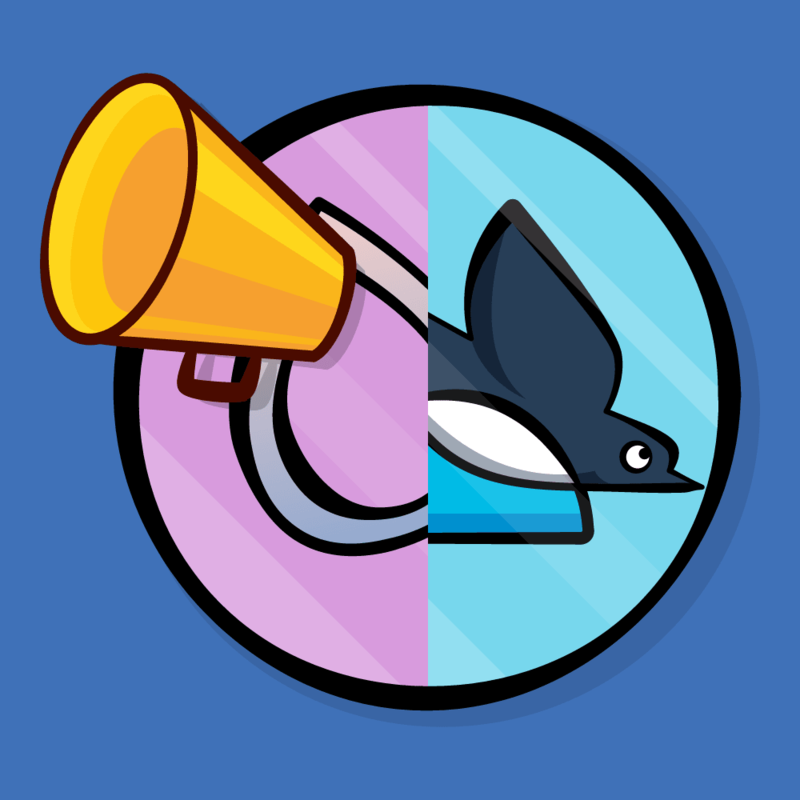 It uses these two versions to load or create a mapping model for the migration, which it uses to convert data in the original store to data that it can store in the new store. Once Core Data determines the mapping model, the migration process can start in earnest. First, Core Data copies over all the objects from one data store to the next. Next, Core Data connects and relates all the objects according to the relationship mapping. Finally, enforce any data validations in the destination model. Core Data disables destination model validations during the data copy. You might ask, “If something goes wrong, what happens to the original source data store?” With nearly all types of Core Data migrations, nothing happens to the original store unless the migration completes without error. Only when a migration is successful, will Core Data remove the original data store. In my own experience, I’ve found there are a few more migration variants than the simple distinction between lightweight and heavyweight migrations that Apple calls out. Below, I’ve provided the more subtle variants of migration names, but these names are not official categories by any means. You’ll start with the least complex form of migration and end with the most complex form. Lightweight migration is Apple’s term for the migration with the least amount of work involved on your part. This happens automatically when you use NSPersistentContainer, or you have to set some flags when building your own Core Data stack. There are some limitations on how much you can change the data model, but because of the small amount of work required to enable this option, it’s the ideal setting. Manual migrations involve a little more work on your part. You’ll need to specify how to map the old set of data onto the new set, but you get the benefit of a more explicit mapping model file to configure. Setting up a mapping model in Xcode is much like setting up a data model, with similar GUI tools and some automation. This is level 3 on the migration complexity index. You’ll still use a mapping model, but complement that with custom code to specify custom transformation logic on data. Custom entity transformation logic involves creating an NSEntityMigrationPolicy subclass and performing custom transformations there. Fully manual migrations are for those times when even specifying custom transformation logic isn’t enough to fully migrate data from one model version to another. Custom version detection logic and custom handling of the migration process are necessary. In this tutorial, you’ll set up a fully manual migration to update data across non-sequential versions, such as jumping from version 1 to 4. Throughout this tutorial, you’ll learn about each of these migration types and when to use them. Let’s get started! Download the resources for this tutorial using the “Download materials” button Included with the resources for this tutorial is a starter project called UnCloudNotes. Find the starter project and open it in Xcode. Tap the plus (+) button in the top-right corner to add a new note. Add a title (there’s default text in the note body to make the process faster) and tap Create to save the new note to the data store. Repeat this a few times so you have some sample data to migrate. Back in Xcode, open the UnCloudNotesDatamodel.xcdatamodeld file to show the entity modeling tool in Xcode. The data model is simple — just one entity, a Note, with a few attributes. 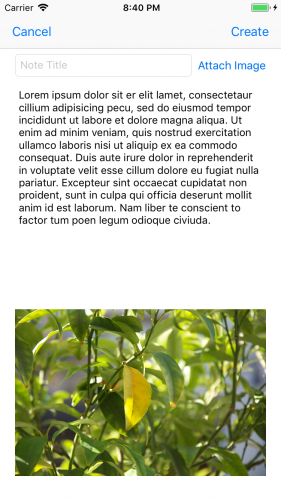 You’re going to add a new feature to the app: the ability to attach a photo to a note. The data model doesn’t have any place to persist this kind of information, so you’ll need to add a place in the data model to hold onto the photo. But you already added a few test notes in the app. How can you change the model without breaking the existing notes? It’s time for your first migration! 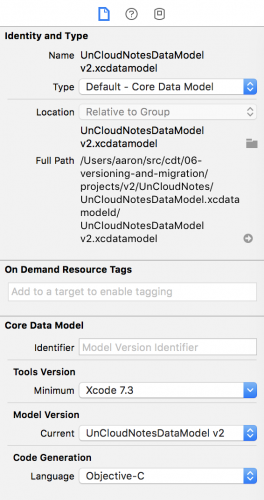 In Xcode, select the UnCloudNotes data model file if you haven’t already. This will show you the Entity Modeler in the main work area. Next, open the Editor menu and select Add Model Version…. Name the new version UnCloudNotesDataModel v2 and ensure UnCloudNotesDataModel is selected in the Based on model field. Xcode will now create a copy of the data model. Note: You can give this file any name you want. The sequential v2, v3, v4, et cetera naming helps you easily tell the versions apart. This step will create a second version of the data model, but you still need to tell Xcode to use the new version as the current model. If you forget this step, selecting the top level UnCloudNotesDataModel.xcdatamodeld file will perform any changes you make to the original model file. You can override this behavior by selecting an individual model version, but it’s still a good idea to make sure you don’t accidentally modify the original file. In order to perform any migration, you want to keep the original model file as it is, and make changes to an entirely new model file. In the File Inspector pane on the right, there is a selection menu toward the bottom called Model Version. Change that selection to match the name of the new data model, UnCloudNotesDataModel v2. Core Data will try to first connect the persistent store with the ticked model version when setting up the stack. If a store file was found, and it isn’t compatible with this model file, a migration will be triggered. The older version is there to support migration. The current model is the one Core Data will ensure is loaded prior to attaching the rest of the stack for your use. Make sure you have the v2 data model selected and add an image attribute to the Note entity. Set the attribute’s name to image and the attribute’s type to Transformable. Since this attribute is going to contain the actual binary bits of the image, you’ll use a custom NSValueTransformer to convert from binary bits to a UIImage and back again. Just such a transformer has been provided for you in ImageTransformer. 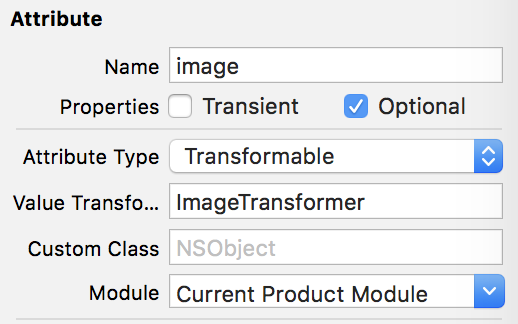 In the Data Model Inspector on the right of the screen, look for the Value Transformer field, and enter ImageTransformer. Next, in the Module field, choose Current Product Module. Note: When referencing code from your model files, just like in Xib and Storyboard files, you’ll need to specify a module (UnCloudNotes or Current Product Module depending on what your drop down provides) to allow the class loader to find the exact code you want to attach. Build and run the app. You’ll see your notes are still magically displayed! 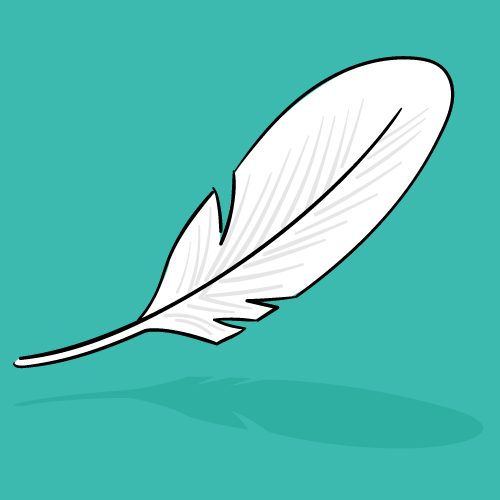 It turns out lightweight migrations are enabled by default. This means every time you create a new data model version, and it can be auto migrated, it will be. What a time saver! It just so happens Core Data can infer a mapping model in many cases when you enable the shouldInferMappingModelAutomatically flag on the NSPersistentStoreDescription. Core Data can automatically look at the differences in two data models and create a mapping model between them. For entities and attributes that are identical between model versions, this is a straightforward data pass through mapping. For other changes, just follow a few simple rules for Core Data to create a mapping model. Note: Check out Apple’s documentation for more information on how Core Data infers a lightweight migration mapping: https://developer.apple.com/documentation/coredata/using_lightweight_migration. As you see from this list, Core Data can detect, and more importantly, automatically react to, a wide variety of common changes between data models. As a rule of thumb, all migrations, if necessary, should start as lightweight migrations and only move to more complex mappings when the need arises. As for the migration from UnCloudNotes to UnCloudNotes v2, the image property has a default value of nil since it’s an optional property. This means Core Data can easily migrate the old data store to a new one, since this change follows item 3 in the list of lightweight migration patterns. Now the data is migrated, you need to update the UI to allow image attachments to new notes. Luckily, most of this work has been done for you. Open Main.storyboard and find the Create Note scene. Underneath, you’ll see the Create Note With Images scene that includes the interface to attach an image. 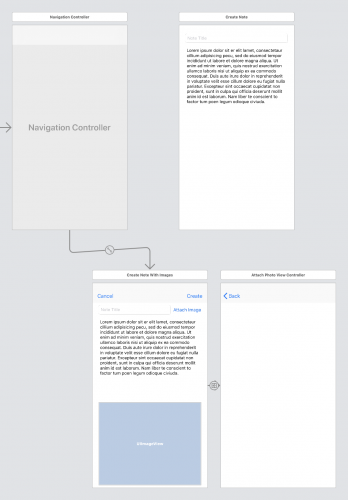 The Create Note scene is attached to a navigation controller with a root view controller relationship. Control-drag from the navigation controller to the Create Note With Images scene and select the root view controller relationship segue. 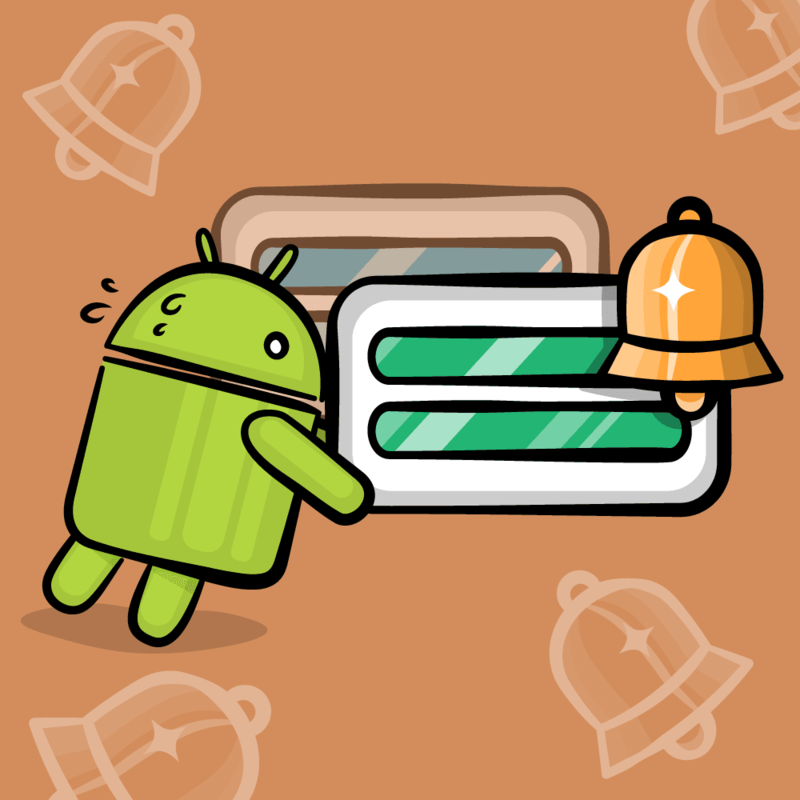 This will populate the new image property of the note once the user selects an image from the standard image picker. This will display the new image if the user has added one to the note. 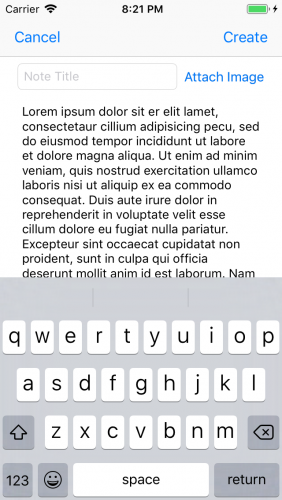 The app uses the standard UIImagePickerController to add photos as attachments to notes. Note: To add your own images to the Simulator’s photo album, drag an image file onto the open Simulator window. 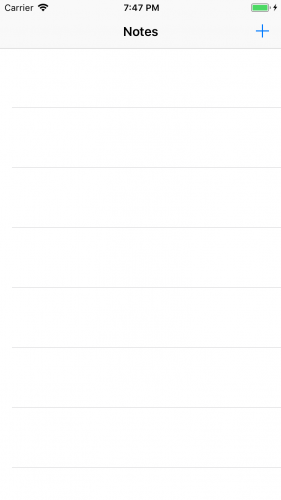 Thankfully, the iOS Simulator comes with a library of photos ready for your use. If you’re using a device, open AttachPhotoViewController.swift and set the sourceType attribute on the image picker controller to .camera to take photos with the device camera. The existing code uses the photo album, since there is no camera in the Simulator. You can download the completed project for this tutorial with the “Download materials” button at the top or bottom of this tutorial. If you enjoyed what you learned in this tutorial, why not check out the complete Core Data by Tutorials book, available in our store? 1. Chapter 1, Your First Core Data App: You’ll click File ▸ New Project and write a Core Data app from scratch! This chapter covers the basics of setting up your data model and then adding and fetching records. 2. Chapter 2, NSManagedObject Subclasses: NSManagedObject is the base data storage class of your Core Data object graphs. This chapter will teach you how you customize your own managed object subclasses to store and validate data. 3. Chapter 3, The Core Data Stack: Under the hood, Core Data is made up of many parts working together. In this chapter, you’ll learn about how these parts fit together, and move away from the starter Xcode template to build your own customizable system. 4. 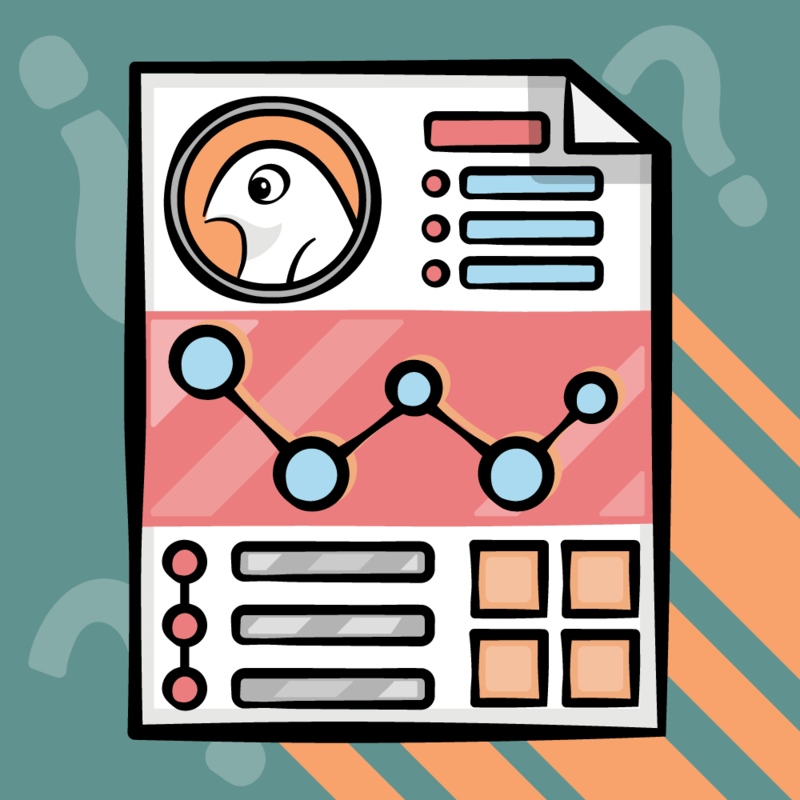 Chapter 4, Intermediate Fetching: Your apps will fetch data all the time, and Core Data offers many options for getting the data to you efficiently. This chapter covers more advanced fetch requests, predicates, sorting and asynchronous fetching. 5. Chapter 5, NSFetchedResultsController: Table views are at the core of many iOS apps, and Apple wants to make Core Data play nicely with them! In this chapter, you’ll learn how NSFetchedResultsController can save you time and code when your table views are backed by data from Core Data. 6. Chapter 6, Versioning and Migration: As you update and enhance your app, its data model will almost certainly need to change. In this chapter, you’ll learn how to create multiple versions of your data model and then migrate your users forward so they can keep their existing data as they upgrade. 7. Chapter 7, Unit Tests: Testing is an important part of the development process, and you shouldn’t leave Core Data out of that! In this chapter, you’ll learn how to set up a separate test environment for Core Data and see examples of how to test your models. 8. Chapter 8, Measuring and Boosting Performance: No one ever complained that an app was too fast, so it’s important to be vigilant about tracking performance. In this chapter, you’ll learn how to measure your app’s performance with various Xcode tools and then pick up some tips for dealing with slow spots in your code. 9. Chapter 9, Multiple Managed Object Contexts: In this final chapter, you’ll expand the usual Core Data stack to include multiple managed object contexts. You’ll learn how this can improve perceived performance and help make your app architecture less monolithic and more compartmentalized. And to help sweeten the deal, the digital edition of the book is on sale for $44.99! But don’t wait — this sale price is only available for a limited time. Speaking of sweet deals, be sure to check out the great prizes we’re giving away this year with the iOS 12 Launch Party, including over $9,000 in giveaways! To be eligible for for this epic iOS 12 giveaway, all you have to do is leave a comment on the original launch post, letting us know which book or course is your favorite on this list — or which upcoming book or course you’re most excited about! We hope you enjoy this update, and stay tuned for more book releases and updates!